This is a review for the supplement Cognimaxx XL. The manufacturer claims that this supplement will improve focus and memory. Read on to learn more about this product and whether or not it is the ideal choice for you. Phosphatidylserine– Works to increase your brain’s function. DMAE- Works to increase memory and cognitive effectiveness. It is recommend that one capsule be taken daily in the morning. It was noted that this dosage will allow users to achieve the best results. There were no possible side effects listed on the manufacturer’s website, but that does not mean there are no side effects that can occur when using this product. Cognimaxx XL costs $47.00 for one bottle, which contains 30 capsules for a 30-day supply. Three bottles can be purchased for $97.00. Five bottles can be purchased for $147.00. Seven bottles can be purchased for $197.00. Each of these prices is discounted at 30%, which is a current promotion on the manufacturer’s website. Without this discount, one bottle costs $47.00, three bottles cost $141.00, five bottles cost $235.00 and seven bottles cost $329.00. 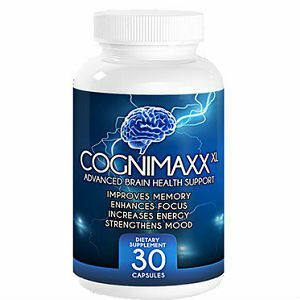 The manufacturer offers a 30-day money back guarantee for those who purchase Cognimaxx XL. If you are not satisfied with the supplement, you can return it to the manufacturer for a full refund as long as it is not past 30 days of the purchase. This is helpful because individual results may vary, meaning what worked for one person may not work for you. There are several customer reviews and testimonials available on the manufacturer’s website. These review are all positive, which backs up the claim that the product improves focus and memory. This can help some people make the decision to purchase the product because they now that it has worked for other users. Cognimaxx XL is said to improve focus and memory. There are many reviews on the manufacturer’s website that back up this claim which can be helpful when you are deciding whether or not to purchase this product. The cost for one bottle is affordable, but the current discount on the manufacturer’s website may encourage to buy more than one bottle which may lower the price. One reason it may not be a good idea to purchase more than one bottle is because the money back guarantee is only for 30 days. If you find that you are dissatisfied with the product, you will be sending back three, five or seven bottles of product instead on one. You also risk losing out on money if you happen to miss the deadline for returning the product. Overall, it seems as if Cognimaxx XL could be an effective supplement. Keep in mind that individual results vary and that there is a chance that it may not work for you. Depending on what you are looking for this product may be the ideal choice for you. Henry Costa	reviewed Cognimaxx XL	on June 14th	 and gave it a rating of 3.5.